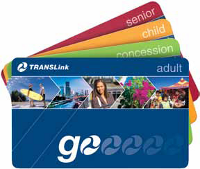 go card is the TransLink electronic ticket that allows you to travel seamlessly on all TransLink bus, train and ferry services. You can buy and top up go card at newsXpress Coomera. 2. Hand us your go card and let us know how much you want to top up - $20, $40, $60, $80, $100, $120, $140, $160, $180 or $200. 3. Pay your chosen amount. 4. We will top up for you and give your go card back with a receipt.